MIT Reads community discussion: Why Are All the Black Kids Sitting Together in the Cafeteria? As a nation, are we having honest conversations about race and racism? 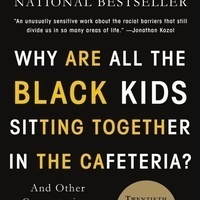 The MIT Libraries invites you to join a discussion of the MIT Reads spring selection: Why Are All the Black Kids Sitting Together in the Cafeteria? by Beverly Daniel Tatum.